Weight of a cat about 2-4 ounces at birth and usually doubled in the first week. Eyes began to open on days 7-10. If the eyes appear closed or are still tight, open and clean with a soft cloth soaked in warm water, then coat Teramycin ointments are available in pet shops. If it is still difficult to open, consult your veterinarian to ensure there is the possibility of infection. The eyes will remain blue until they are 6-7 weeks old, but the actual eye color will appear when the cats aged 3 months. At week 3, the cat will begin to crawl and stand up to their ears begin. At week 4, they started to play around and his teeth began to grow. 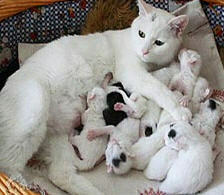 Mother cat usually begin weaning the kitten at the age of about 4 weeks. At the age of 8 weeks, kittens start solids. Kittens at this age can still be fed by the mother cat, but this is not a major nutritional needs, just to make the kitten feel comfortable close to its parent. Usually the kitten should not be separated from its mother until they are aged at least 8 weeks. Kitten separated from its mother in a very young age will usually be more spoiled and finicky and require extra attention. Do not give cow's milk can cause diarrhea. Give milk that is specially formulated for cats. Diarrhea that does not stop more than 24 hours requires special attention. If it gets worse you can check it to the vet. Provide clean, fresh water at all times for your cat. Beverage containers must be low enough so your cat can drink water from a place with ease. Cats usually like to play with water and often pulling the container so that drinking water is easily spilled. Therefore, choose a fairly heavy drinking container. Place the container in place an affordable drink by your cat and quite far removed from their toilet. You can provide dried food or tinned food for your cat, or a combination of both. Be sure to choose foods that are specially formulated for cats. Kittens need nutrients that are different from adult cats. Therefore, choose foods that have a complete nutrition for their growth. You can find these foods at the pet shop. Read and follow the instructions listed on cat food packaging carefully. If the sign COMPLETE listed, it means the food contains all the nutritional needs of cats health, if there is a sign of complementary, means of food requires a combination of other foods to meet nutritional needs of cats. 8-12 week-old kittens need food 4 times a day, ages 3-6 months 3 times a day, and 7-month-old cat ank 2 times a day. You can also give dried foods can be stored for long periods, but do not forget to occasionally replace it with wet food that your cat does not become bored. Kittens should be kept warm in a state. Unfortunately, their bodies are too small to be able to maintain their body temperature. That's why they love to hug each other. Kittens aged less than 10 weeks need a warm place. You can give light to warm them or give them a fairly thick blanket as a bed. You will need a plastic litter tray can be filled with sand, or sand cats are available in pet shops. Soil of the garden should not be used for the litter tray, especially for cats that have not been vaccinated, because it feared could carry the disease from other cats that make the soil as a toilet. litter tray should be backed with paper to avoid spilling of sand for digging cat, or, if any, use a litter tray which is much larger. Put the litter tray in the corner of a quiet and easily accessible so that your cat is not disturbed. Make sure the litter tray is located close to places to eat and drink. Cats are usually reluctant to use the litter tray if it is too close to places to eat and drink them. Do not forget to frequently clean and replace the sand in the litter tray on a regular basis so your cat can continue to use it comfortably. In general, cats do not feel comfortable with the litter tray that smelled bad. Cats have a habit of cleaning themselves by licking her body, they learn naturally from the mother. You can of course help to clean themselves with their body wash with a towel moistened with warm water. You can bathe them if it is really in a state of impurity. Make sure you wash them with warm water temperature so that they do not panic when bathing. Do not forget to clean their bodies with a special shampoo that cats can be found at pet stores. Dry with a soft towel and hair dryer (for animals) to be dry, because wet for too long will make them cold. You can make your cat to be friendly and easy to make friends with anyone as long as you want to help them by providing time for play and pamper them. Stroked their bodies, especially on the chin and around their ears. let your cat feel relaxed by giving them a light massage around their bodies. They will really enjoy your touch and begin to feel much closer to you so they know you better. Talk to them with a soft tone because they are afraid to voice yelling or harsh tone. Play a very important for cats. They learn to interact, build up their physical ability, training, and have fun. Cats enjoy their play time with running, scratching, and licking each other and hugged each other. Cats require precision. In addition to maintaining our health from the invasion of disease carried by cats, we also need to keep your cat's health. A. Keep your kitten drinking milk from its mother on a regular basis. 2. After beginning to eat, give food to the food daily. 3. Provide and make it a habit to defecate outside the house of sand. 4. Familiarize and train the ability of interaction with humans and other animals. Kittens are interested in playing with objects in the vicinity. Running and climbing exercise is a means to defend themselves. Therefore, you need to be aware of objects that might fall due to the activity of your cat. At that time, the nails start to grow to claw or scratch. However, when we already know, it bites and cakaranya of people are just joking around. The instinct to kill the time was not yet fully emerged. It is considered new, and saw an especial concern. Furthermore, the kitten continued to experience growth, which is marked by the growth of all the milk teeth. Body temperature began to be controlled and maintained, even begin to clean themselves by licking their coats. At the time playing with children should be supervised, because the claws and teeth begin to be dangerous. Interaction with other cats also began to take shape. See the profiles of experts named Eddie Choufi on twitter. There are 3 experts named Eddie Choufi, who utilize twitter to trade data. See what Eddie choufi (eddiechoufi) has found on twitter, the world's greatest gathering of the loved and admired things.